100 recipes in 1 year update: 72 recipes re-created and 28 left to re-create before October 1st!! 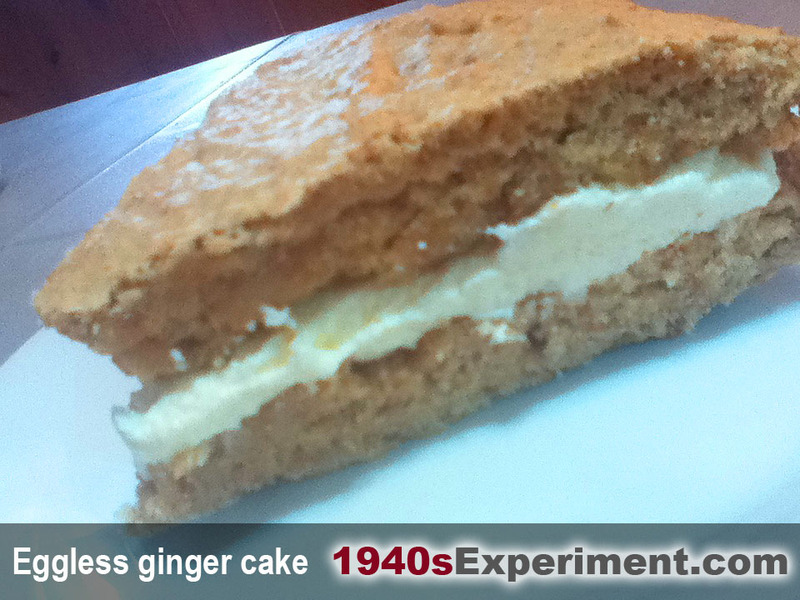 This is a very simple eggless ginger cake recipe. I found it tasted rather boring when it came out of the oven so decided it needed livening up with some mock cream. I used this mock cream recipe but to make it less gritty I ground it down further using a pestle and mortar.. So my lunch was tea and ginger cake, which was rather nice for a change.. This entry was posted in Uncategorized and tagged eggless ginger czke, homefront recipes, recipes 1940s, wartime recipes. Bookmark the permalink. ← We are worth it! Wow!!! this tasted great when i made it! Lemon or any acid will do as it’s only to activate the rising agent. You can also omit the acid if your liquid is buttermilk, sour milk or plain yogurt – it’s basic chemistry. Sift the flour. Cream margarine and sugar together. Mix the milk, vinegar and bicarbonate of soda (it will rise and froth) then blend altogether and then stir in fruit. Bake in a 7 ” lined tin at 350F/180c for 1 hour.